The General Ledger for Excel consists of 50 ledger accounts for data entry and automatically updating trial balance, profit and loss income statement and balance sheet. 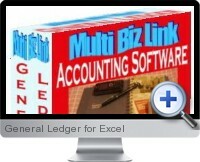 the complete general ledger accounting system in Excel is designed as a convenient and accurate accounting solution for small to medium sized businesses. Specify the currency to use during setup. Integrated Trial Balance, Income Statement and Balance Sheet are generated automatically by the system. Additional reports and summaries are available. Data entry is simple, user friendly and accurate without requiring accounting knowledge. 50 ledger accounts include 6 Current Assets Accounts, 4 Fixed Assets Accounts, 5 Current Liabilities Accounts, 4 Long Term Liabilities Accounts, 1 Partners' Capital Account, 5 Sales Products Accounts, 5 Purchases Products Accounts and 20 Expense Accounts. Upgrades to 100s of accounts are also available to be purchased. Standardized parameters drive the application. Customization to customer's specification is available on request. Free 24/7 email technical support is provided for the first year.